Refa appointed Chinese celebrity Fan Bingbing as ambassador. Photo credit: Refa Twitter. The vaunted 10-step Korean skincare routine is now an established beauty ritual in Western countries, but to Chinese millennials, skincare routines that spread layers over layers of creams on the face have become passé. Instead, they’re turning to a mysterious and futuristic science to transform their appearance that’s known cryptically as “Black tech” (黑科技). It involves technologies such as radio frequency, LED light, micro electric current, and T-sonic pulsation—sci-fi sounding words that have become common topics among this generation of “skintellectuals.” It’s a trend that many consider a natural amalgam of two big Chinese millennial interests: beauty-tech and skincare. Since 2016, hi-tech, anti-aging beauty devices have been quickly gaining in popularity. From January 2016 to October 2017, the search volume for “beauty devices” on Baidu experienced a six-fold increase, and online sales figures support that popularity, too. Tmall Global’s imported beauty device division grew 700 percent in 2017 and compared to other markets, China’s consumers have a much younger profile: 80 percent of the beauty device consumers are under 35 years old, and 30 percent are under 25. Here are three trending black-tech product categories that Chinese millennial skintellectuals are raving about. Fan Beauty launched a collection of the facial machine. Photo credit: Fan Beauty Weibo. According to CBN Data’s post-90 and post-95 cross-border shopping report, Japan has been Chinese millennials’ favorite shopping destination for beauty since 2015 and the fastest-growing category in the “J-beauty” scene are high-tech facial rollers. The Japanese brand ReFa accounted for half of the total revenue on facial rollers, and during last year’s November 11 Singles Day shopping festival, Tmall sold more than $4 million (RMB 27.5 million) worth of ReFa machines in one day. The futuristic sounding name ReFa is short for Radio Frequency, a technology that heats the skin to prevent wrinkles. Although they already have youthful-looking skin thanks to their age, Chinese millennials nonetheless are raving about the youth-ifying effects of this electric roller. On Weibo and RED, beauty influencers brag about ReFa’s face-slimming effects, something rounder-faced Chinese women are fawning over. That’s because today’s Chinese beauty standards heavily promote a V-shaped face—one only needs to scan the popular, young Chinese celebrities to see how prominent the feature is in Chinese society. 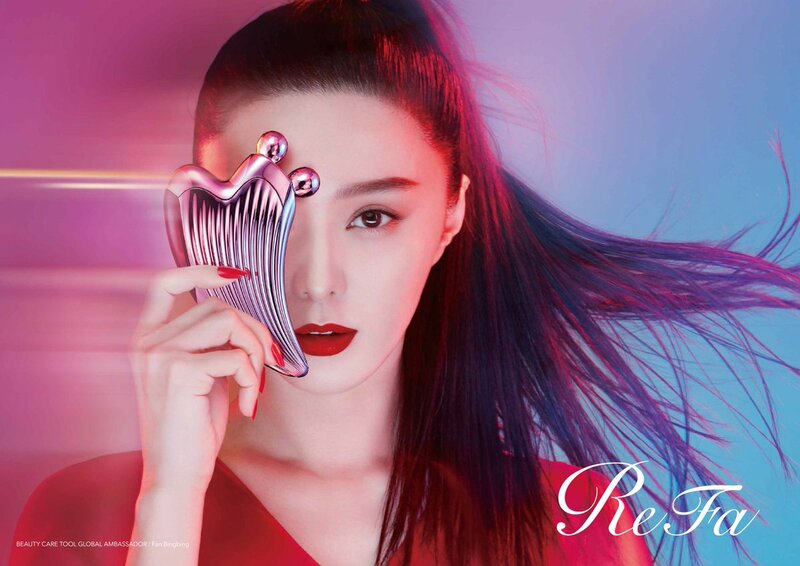 In fact, ReFa’s celebrity brand ambassador Fan Bingbing is the perfect example of the V-shape beauty archetype many Chinese women want to emulate. Sensing the potential of high-tech beauty devices, Fan Bingbing even launched her own brand called Fan Beauty this past March. Not surprisingly, the first product in Fan’s line is a $303 (RMB 2,081) radio frequency facial machine. With its macaroon-colored body, the Scandinavian brand Foreo’s facial cleanser was bound to become a social media star. It looks great in photos, and many Chinese pop idols like Guan Xiaotong and Faye Wong have posted themselves using the brand’s cute cleanser in their social media feeds. Besides its good looks and decent price point—averaging $240 (RMB 1,646)—the high-tech cleanser claims to offer extra-deep cleaning along with advanced anti-aging benefits, and its T-Sonic feature supposedly leaves your skin in the ideal condition for your next multi-step beauty routine. International mega brands like SK-II are also adding black-tech beauty products to their rosters. In 2017, the company launched a massage booster that features 7,000 micro-magnetic pulses per minute for firmer skin. During SK-II’s 2017 “TMALL Super Brand Day,” the brand sold out all of its 10,000 massage booster sets and achieved over $6 million (RMB 41.2 million) in overnight sales. Although the product launch might seem contradictory to SK-II’s more feminist marketing stance, the brand adopted the slogan “My beauty is not superficial” (我的美丽不表面) in order to frame their massager with a message of self-care rather than one focused on anti-aging. Since many Chinese women seek glowing, wrinkle-free skin, the black-tech frenzy among young Chinese skintellectuals should only continue to gain momentum. While Jade Roller’s recent Instagram popularity shows how low-tech, natural products can win over Western consumers, Chinese millennials are seeking a different beauty path: one with more hi-tech products that offer an even younger appearance. The Chinese obsession with youthful beauty is a product of social factors such as age-shaming and rigid beauty standards, so as long as these circumstances exist in China, we can surely expect more and better black-tech beauty products to come.